You can knock this up in under an hour and it makes a great dish to serve to a group of friends. Even my meat-loving friends adore this dish! It is substantial enough to serve as it is but if you really want you can serve chunks of garlic bread and a salad on the side. 1 cup of Arborio Rice. 5 cups of bouillon powder stock. 1 teaspoon of Porcini powder. In a roasting pan sprinkle the cubes of butternut squash with salt and fresh sage, drizzle with olive oil. Roast your butternut squash for 40-50 minutes (Gas mark 6). Once cooked, mash and leave to the side. Melt the butter in the frying pan. At the same time make the stock in a separate pan. Add bouillon powder and porcini powder to four cups of boiling water – keep the stock simmering in a pan on a low heat. Add the onions and garlic to the frying pan and sauté on a medium heat until softened. Add the arborio rice and cook until translucent this normally takes approximately 4-5 mins. Add the mushrooms and cook for a further 5 minutes. Pour in the wine and stir the rice and mushrooms until the liquid is absorbed. Repeat this process two more times with the stock, adding one cup at a time until the liquid has been absorbed ensure you stir the mixture to prevent it from sticking. Add the kale and puréed butternut squash followed by another cup of liquid. Add the final cup of stock and when this has been absorbed turn heat off and top with vegetarian Parmesan and grilled asparagus! If you have any leftovers – something that rarely happens in my house – this risotto makes the perfect base for arancini! This recipe serves four hungry mouths! I think it also tastes delicious cold! You can also shuffle around the veg to suit your preferences. I have added artichokes, sweetcorn and petite pois before and they all tasted great! 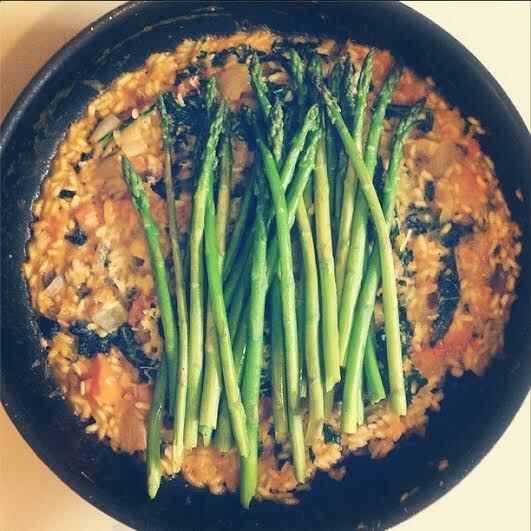 Posted on April 14, 2015 August 29, 2017 by TinaManahaiPosted in RecipeTagged April, Asparagus, Cooking, dinner, Food, Italian, Kale, One Pot, Risotto, Vegetarian. Previous Previous post: PHOTOGRAPHY PROJECT: A WALK BY THE SEA!